The events and attack in Charlottesville have offered this country another mirror in which to view itself. While white supremacy has been emboldened by the words and policies of Donald Trump and his supporters, the election of 45 did not create the problem. Racial justice does not exist in the country. It never has. It is up to us to fix it. For white activists, this is an opportunity to be a true ally, to stand up to racism alongside people of color. We can start by taking a stand against white supremacy and demanding that our legislators do the same. Below are some ways you can act against hate. Fight systemic racism and protect the free speech of our transgender and activists of color. Sign this petition to stop censoring and banning the Facebook Accounts of Black and Trans Activists. Demand Congress formally censure Trump for his endorsement of white supremacy. House Democrats Jerrold Nadler (D-NY), Bonnie Watson Coleman (D-NJ), and Pramila Jayapal (D-WA) have introduced a resolution of censure condemning Trump's failure to adequately condemn the white domestic terrorism committed in Charlottesville and his hiring of white supremacist sympathizers Steve Bannon and Sebastian Gorka. Click here to contact your reps via 5 Calls. Urge for the removal of Gorka and Miller from The White House. The White House needs to cut ties to these two divisive figures to show the nation and the world that the President does not endorse racism, white supremacy, the KKK or Nazism. Click here to contact your reps via 5 Calls. Demand our representatives cut ties with groups designated as "hate groups," and other white supremacist organizations. Sign this petition created by Anthracite Unite calling on Congressman Lou Barletta to resign from the National Board of Advisors of the Federation for American Immigration Reform (FAIR), a Southern Poverty Law Center-designated hate group. State House Rep Brian Simms has introduce a resolution condemning the events of Charlottesville and white supremacy in general. Please write to your representative and ask them support Rep Simm's resolution. Senator Daylin Leach has also introduced a resolution in the PA Senate condemning the attacks and calling on the PA Assembly to label hate groups as terrorist organizations and their acts as terrorism acts. Write your legislator and ask them to support this resolution as a cosponsor and with a "yes" vote when the resolution comes to the floor. Perhaps more dangerous than the overtly racist acts that make the news, are those that continue unnoticed because they are systemic. 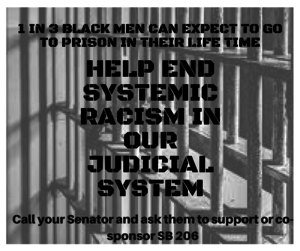 Help fight systemic racism in Pennsylvania by writing your legislator about SB 206 or calling them using this call script. Push your municipality to pass a resolution naming white supremacy and other hate groups as terror groups. Push your municipality to create an Institutional Racism Task Force to investigate the causes of and to find solutions to systemic racism in your city or town. Click here to read about how they are doing it in Austin, TX and how other cities can follow suit. Refuse to vote for any politician who doesn’t clearly condemn racism and white supremacy (and not just the Nazi kind but the systemic kind, too). Report Confederate Symbols in your community. CAP has launched #TakeThemDown. If you have a confederate symbol in your town, take action now! Call on your local elected officials to #TakeThemDown using this handy tool! Then sign the national petition here. If you’re striving to take steps towards being a white ally but you don’t know where to start, you can look into Safety Pin Box. Watch these videos from Race Forward explaining systemic racism. Attend a solidarity rally here in Pennsylvania. Search for an event near you. Attend a training on fighting for racial justice, like those organized by SURJ. Share this graphic to social media. 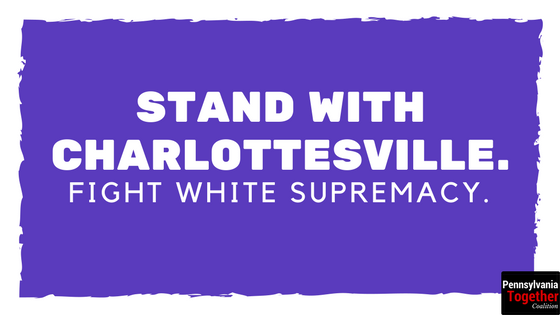 You can donate here to support the legal fund for the Charlottesville, VA anti-racist activists. Donate to the Black Student Alliance of University of Virginia fund here. Find people of color led organizations in your community and donate to them. Donate to the Legal Aid Justice Center which provides legal assistance to low-income individuals.